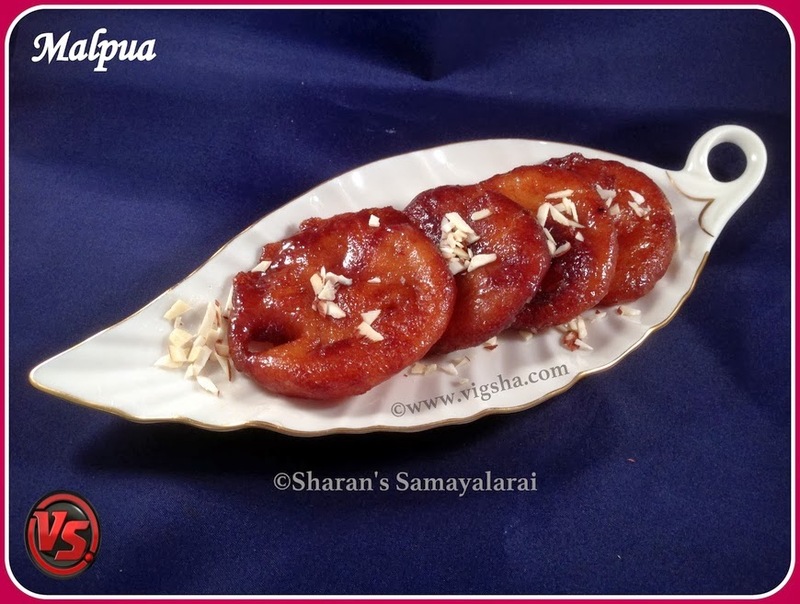 Malpua is a delectable, rich and traditional North-Indian sweet. The taste just melts in your mouth. This was a delicious attempt and I followed Sanjeev Kapoor's recipe. Original recipe calls for milk and reducing it to thick consistency. But I have used milk powder. 1). In a mixing bowl, add the milk powder, maida and mix it well. Add water little by little and combine well without any lumps. The batter* should be little bit thicker than dosa. 2). Prepare sugar syrup by mixing 1/2 cup water and 1/2 cup sugar and dissolve it for 3-4 minutes. When you have sticky syrup consistency, reduce the flame to low. 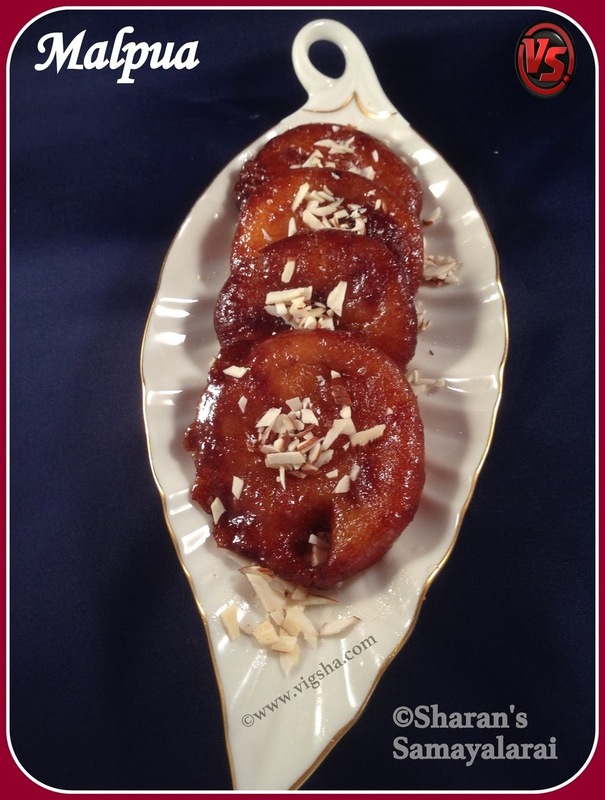 Soak saffron in a tbsp of warm milk and add it to the sugar syrup along with cardamom powder. Mix it well and keep the syrup warm. 3). Heat oil in a pan, take a ladle of batter and pour that on to the hot oil (The batter will spread itself into small discs). Deep fry in medium flame, till both sides turns golden brown. 4). Drain them in tissue paper, and drop them in the warm sugar syrup. Let them stand for a minute. Repeat the procedure for the remaining batter. Arrange them in a plate and garnish with chopped nuts. # While adding water, add little by little don’t pour all at once. # The batter* consistency should neither be thin nor thick. When pouring the batter in oil, it should not run, it should hold shape of a circle. Let this batter sit for 10 to 15 minutes. # If the batter is too thin, it will break apart. Make the batter thick by adding maida or make it thin by adding milk / water.